Continuing my quest to attack everything that doesn't breath with Embossing Paste! 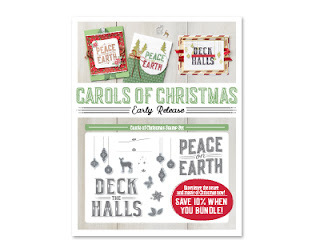 I started out by making stencils with the dies in the Cardfront Builder set (which matches the Carols of Christmas stamp set - available as a bundle to save 10%). These products will be available from 1st August as an early release from the Holiday Catalogue (due later this year). I then placed the moon and stars stencil onto a piece of Smoky Slate cardstock and used a small amount of Embossing Paste straight from the pot. 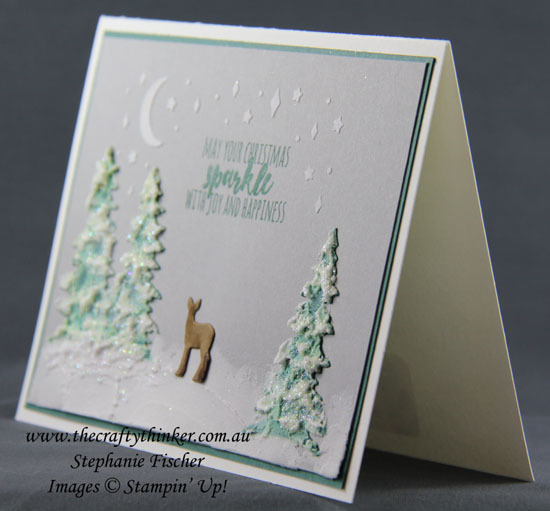 When that embossing was dry, I positioned the two tree stencils and used Embossing Paste that I had coloured with a drop of Tranquil Tide ink. Once that layer was dry, I went back to using the paste direct from the pot to add snow to the trees and foreground. While it was still wet, I sprinkled it with some Dazzling Diamonds which sparkles nicely - although I didn't manage to capture it with my photography. I have mislaid my stamp set (!!!) so I cut out the deer and watercoloured her. 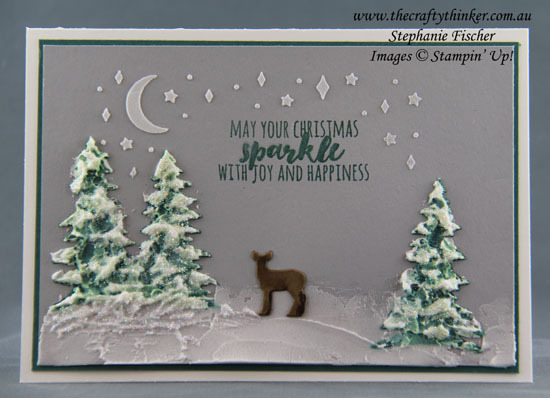 I stamped the greeting with Tranquil Tide ink and then added a layer of Wink of Stella to the word "sparkle", although it doesn't show in my photographs. The trees have quite a bit of depth to them!